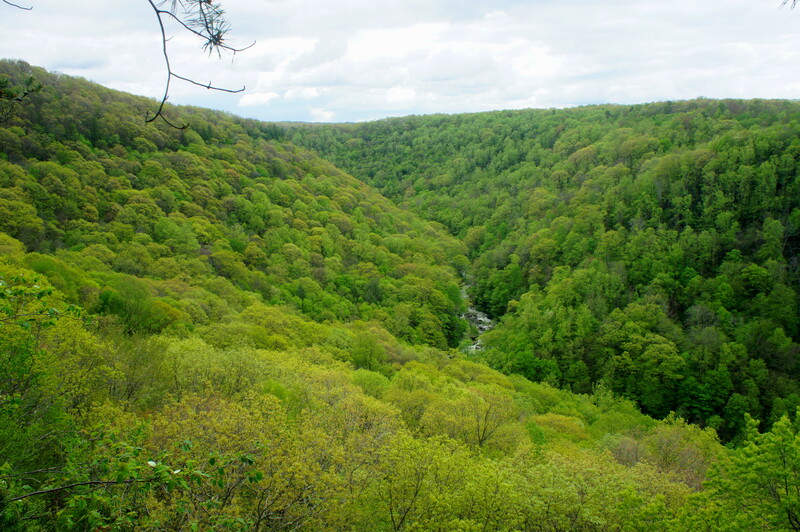 Especially in the spring, when water levels are particularly high, the Skyline Trail – Narrow Gauge Trail Loop in Babcock State Park is simply spectacular. 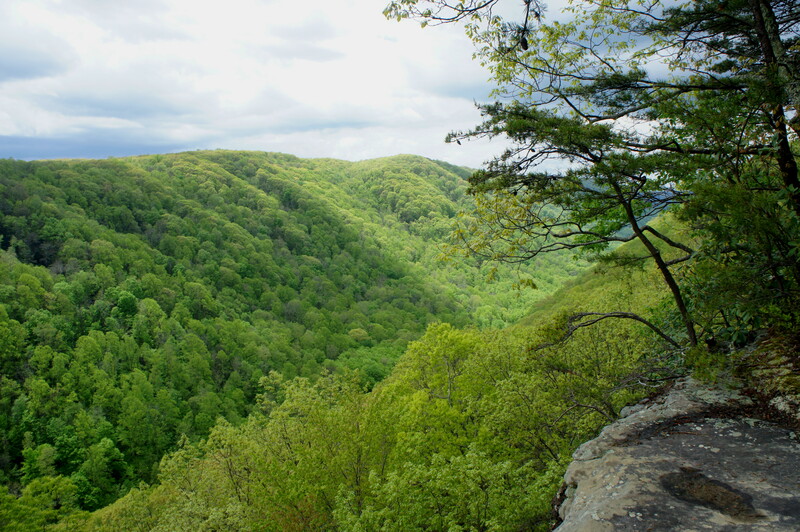 This 4,127-acre park in south-central West Virginia, often dwarfed by its larger and better-known neighbor, offers greater solitude and intimacy than New River Gorge National River. 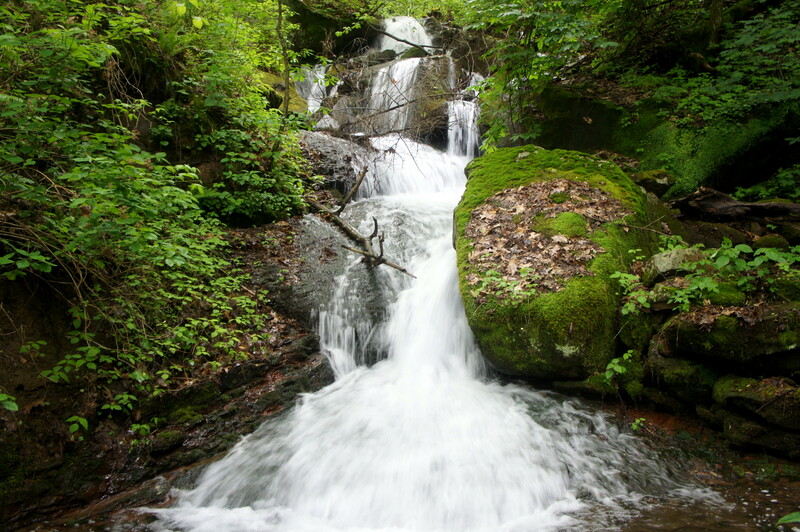 What the Skyline Trail offers in magnificent views of lush valleys, the Narrow Gauge Trail matches with roaring rapids and—after snowmelt or significant rainfall—ubiquitous waterfalls. Together the two trails make for a fine half- or full-day hike, a roughly 8-mile loop around Babcock State Park. 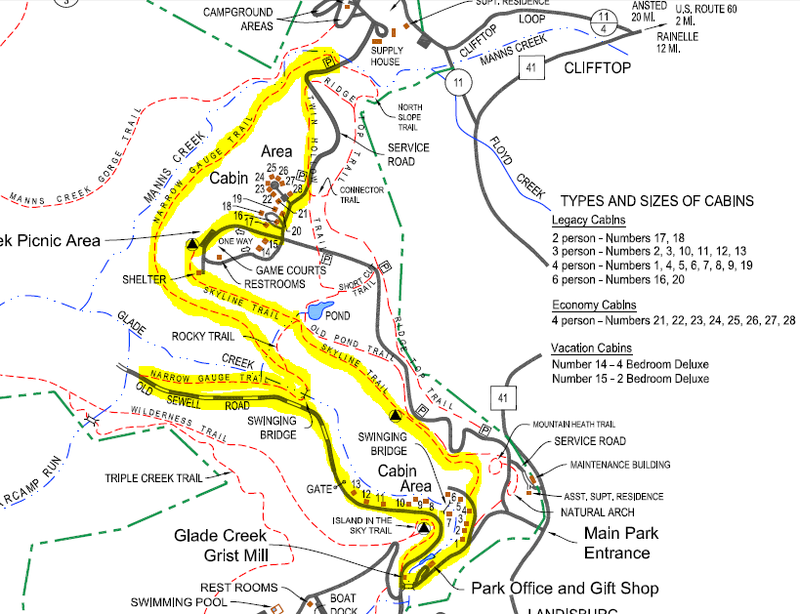 One can start this circuit from a number of points—for example, it’s easily reachable from any of the park’s 28 overnight cabins—but the most logical start and end point is at the Park Office, perched on the banks of Glade Creek as it passes under the Glade Creek Grist Mill. The park headquarters is the best place to get maps and other information for Babcock, as well as a snack or souvenir at the surprisingly extensive gift shop. 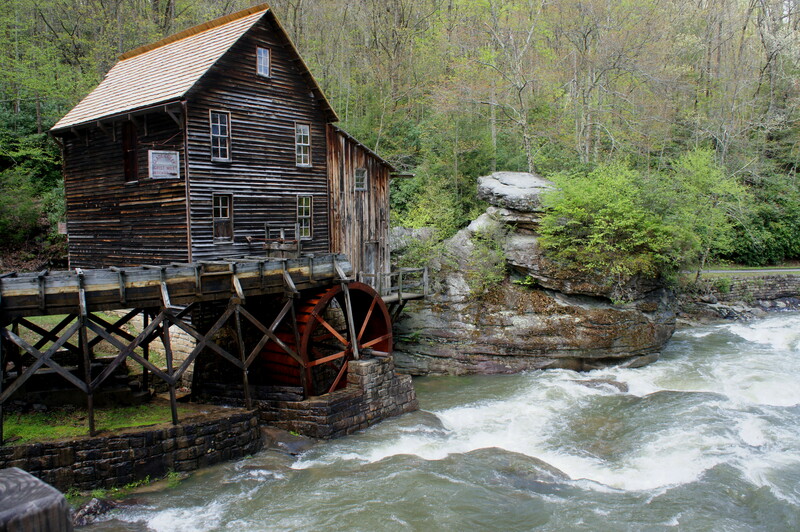 Across the stream, it’s impossible not to fall for the quaint charm of the grist mill, suspended just above a 10-foot waterfall, making it one of the most photographed places in West Virginia. The present structure was completed in 1976, built as a re-creation of the old Cooper’s Mill, which burned down in the 1920s. 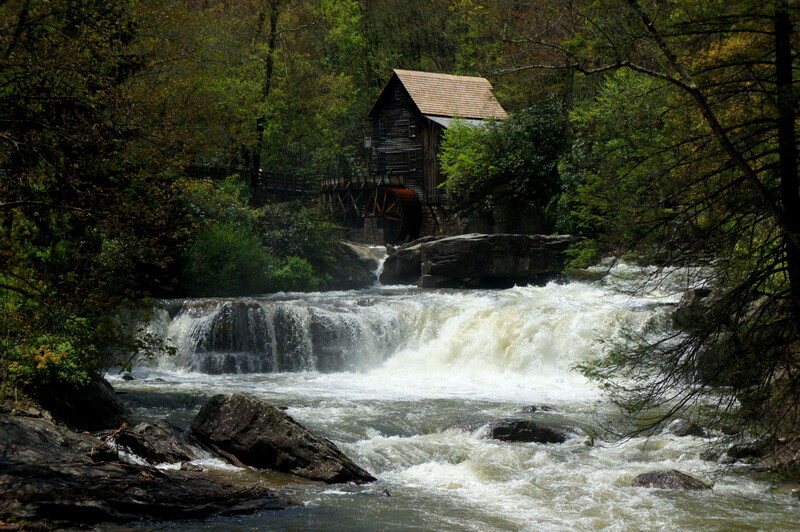 When you’re ready, leave the Grist Mill behind and begin the half- to full-day hike. Facing south from the Park Office (toward the bridge over Glade Creek), turn left onto Babcock Road, which immediately leads uphill as it climbs the woody slope above the Park Office. Take another left after about 300 yards, following the sign to Cabins 1-6. Rhododendrons line the narrow asphalt road on the right as you pass cabins 1-4 on the left. 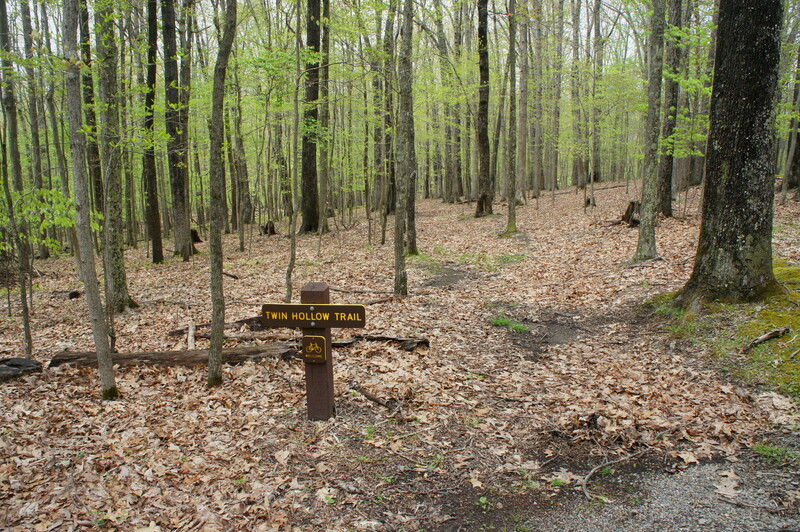 After cabin 4, look for a sign on the right indicating the start of the Skyline Trail. 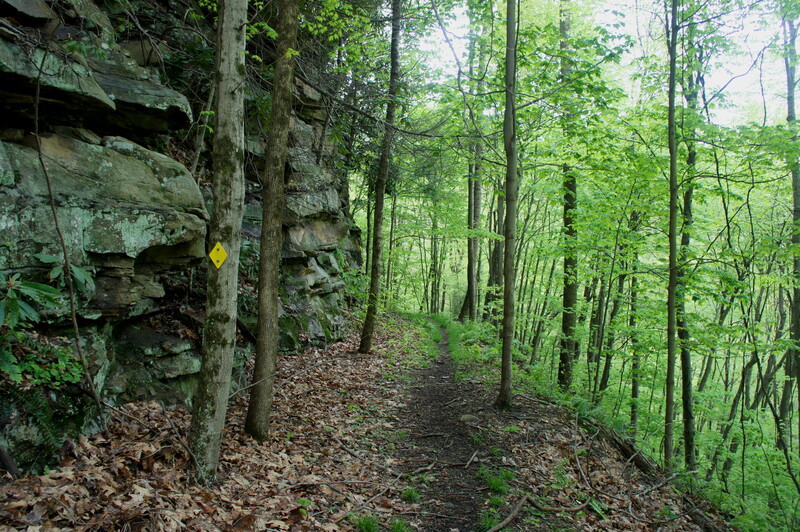 Following yellow blazes, make your way up the Skyline Trail as it follows a small stream on the right. Rocky stairs and steep inclines abound as the route climbs more than 150 feet to clear the ravine before topping out on a wooded shelf. One quarter-mile from the start of Skyline, hikers cross a second tributary. Sandstone outcrops, composed of sediment deposited more than 300 million years ago, are ubiquitous. The first unobstructed viewpoint comes at around 8/10 mile—or a half-mile from the beginning of the Skyline Trail. Peering down from the clifftop, the Glade Creek Valley unfolds below, completely covered in trees and brush. 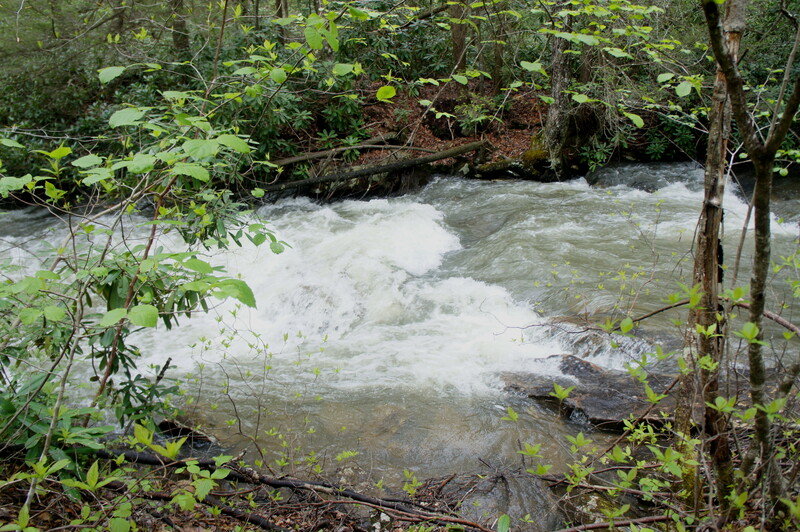 While shrouded from view, the thundering rapids of Glade Creek can be heard echoing throughout the vale. Continuing along the now mostly level trail, there are additional viewpoints, though none quite as good as the first—that is, until 1.3 miles, when you reach the first “official” overlook (read: marked on the map). 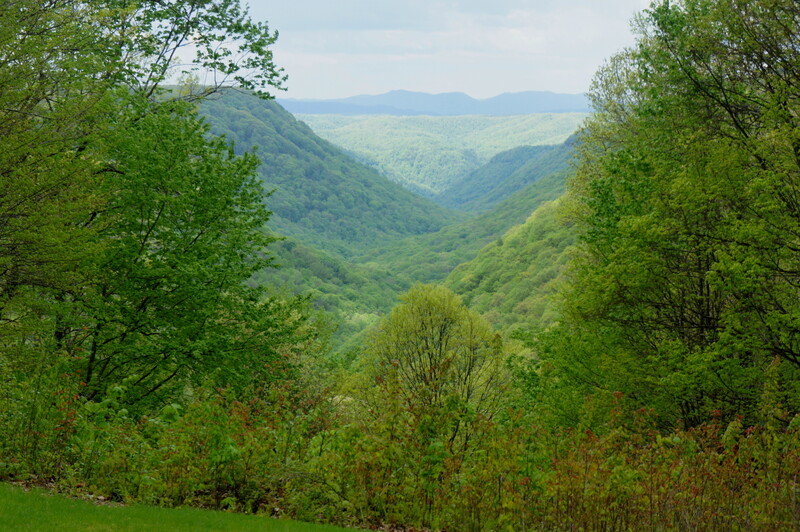 Here a break in the trees (probably not a natural occurrence) perfectly frames the valley carved by Manns Creek, a lengthy tributary feeding into the mighty New River Gorge to the west, and provides a view to the Cumberland Mountains, situated around 15 miles west as the crow flies. A pair benches offer a chance for rest and reflection, while the road to Manns Creek Overlook (Park Forest 802) is easily reached to the right. There is also a trail junction at the overlook: the east-west bearing Old Pond Trail dips down here to meet the Skyline Trail; stay left on the more interesting Skyline route. Beyond the overlook, the trail drops and skirts a bowl-shaped ravine, followed quickly by another, smaller gully. 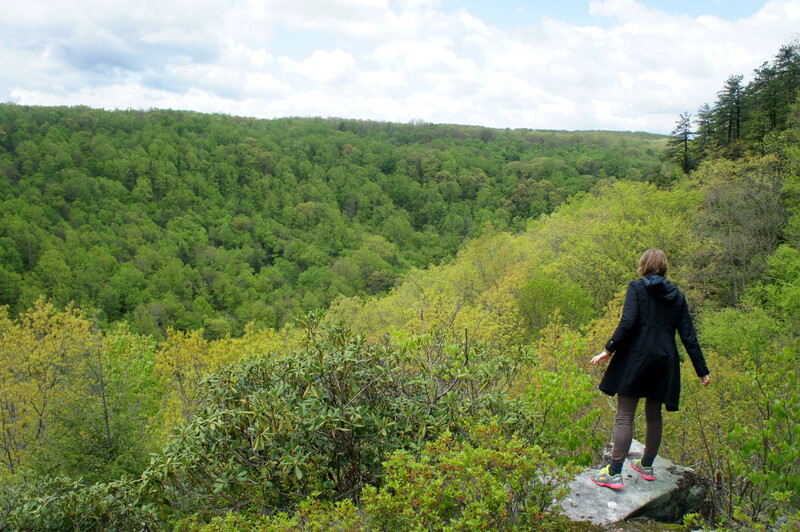 At 2.8 miles—around ½ mile from the overlook—peer out over the cliff edge for another excellent view. Here you can make out Glade Creek to the south, plus another nice view to the west. There is another, similar viewpoint a couple hundred yards up the trail. Around two miles from the start, the trees seem noticeably larger and thicker, casting a dark shadow over a rocky ravine that usually bears water. 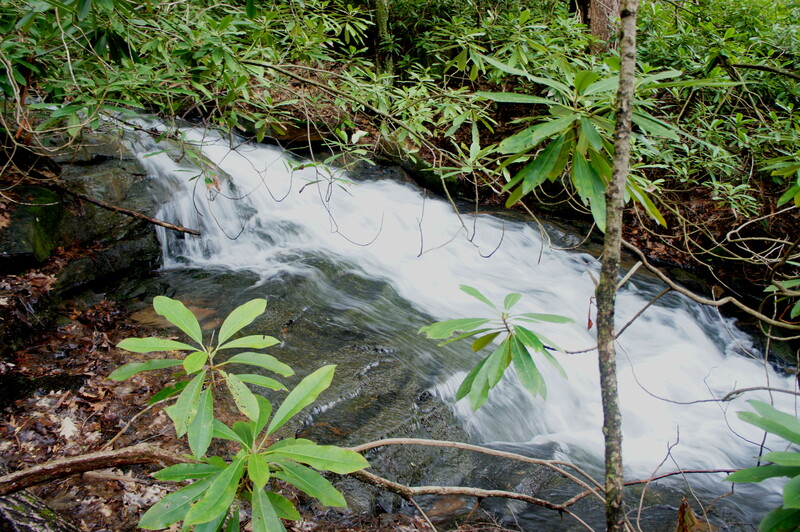 Cross the stream and come to a junction with the Rocky Trail—a steep and strenuous, 1/3 mile shortcut down to the Narrow Gauge Trail. (Note: For those short on time, you can take this shortcut, trimming about three miles off the hike but missing some nice scenery.) To continue along the Skyline Trail to its end, stay right. Among the highlights of the final half-mile to the terminus of Skyline are a noticeable increase in the number of trailside cliffs and a couple narrow passages between rocky protrusions. At about 2.4 miles, a picnic shelter is visible up the hill on the right; it’s a couple minutes’ walk from here to the road, where the Skyline Trail ends and a second official viewpoint provides another nice view of the Manns Creek Valley. This is the Manns Creek Overlook/Picnic Area. The next section is less than scintillating but links the Skyline and Narrow Gauge Trails. Begin by bearing left on the paved road from Manns Creek Overlook, following the drive for 1/3 mile to a 4-way intersection. Take another left, passing the entrances to Cabins 17-20 and Cabins 21-28. Finally, after about ½ mile of road-walking, bear left on the signed Twin Hollow Trail. There’s not much to Twin Hollow except a gradually-descending jaunt through a minor drainage, and it’s over before you know it. After 4/10 mile, the trail meets the road again. Across the drive is the start of the Ridge Top Trail; bear left on the road instead, following it around a sharp right-hand bend and then eastward downhill, toward the campground area. The next parking area on the left marks the start of the Narrow Gauge Trail. As the name suggests, the Narrow Gauge Trail follows an old railroad line, which closed in 1956. Now an administrative road, the route is wide and easy to follow. 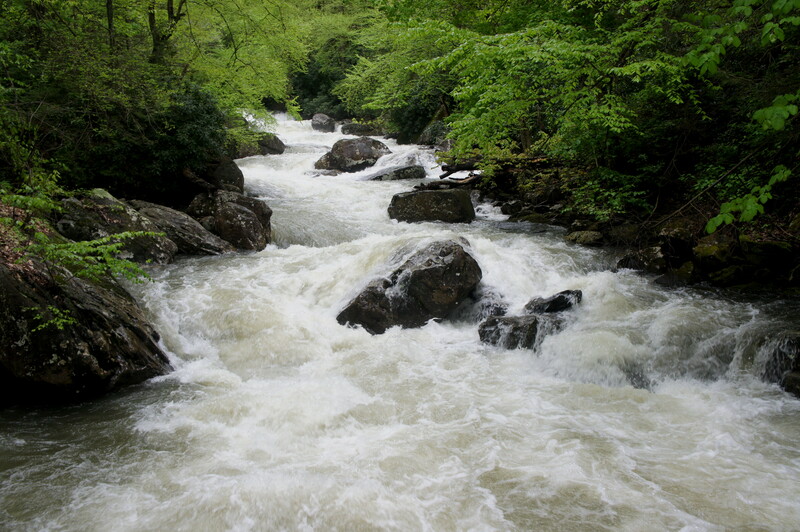 For the first mile, the trail follows Manns Creek, which quickly picks up speed as it transforms from a relatively calm stream to a roaring, cascading waterway. 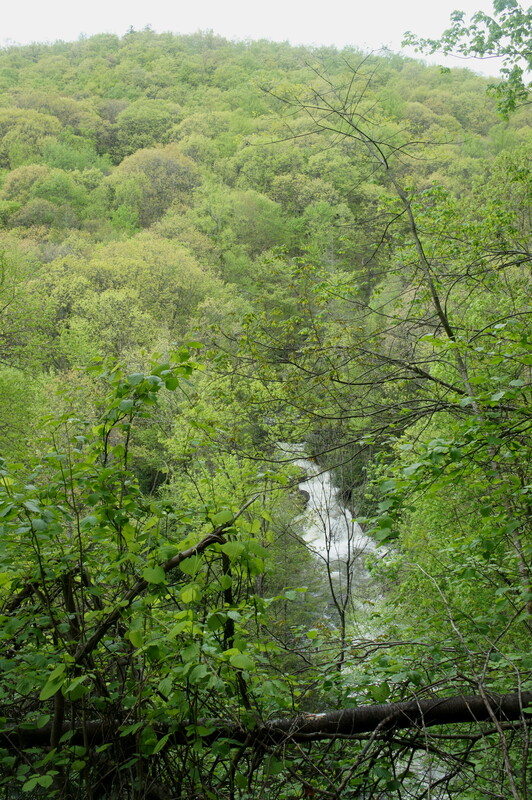 Unfortunately, unobstructed views of the cascades are scarce: at first, as the road continues at creek level, dense thicket blocks access…then, as the creek tumbles down the valley, it eventually drops to a point more than 200 feet below the gradually-descending trail, further obscuring views. 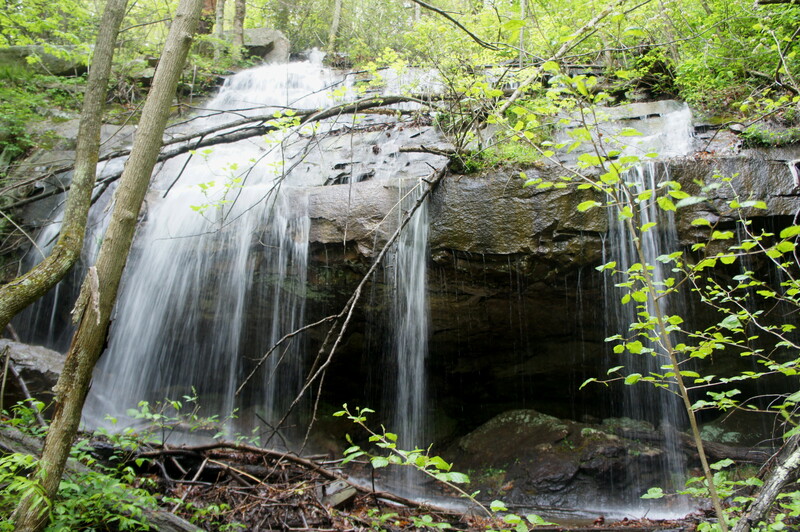 But the thunderous roar of the creek is ever-present, and sporadic offshoots produce small, secluded waterfalls. 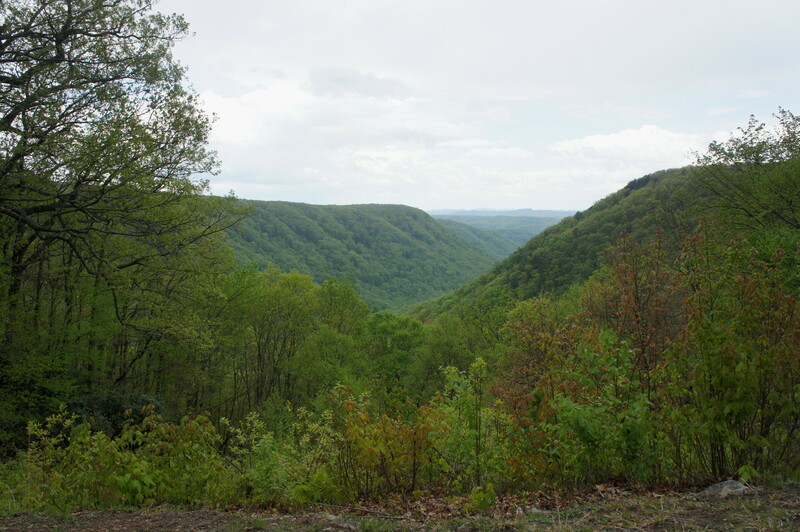 About a mile from the start, the Narrow Gauge Trail rounds a wide corner and bears east, this time skirting the north slope of the Glade Creek Valley. Around five miles into the loop hike, the smooth grade is interrupted; probably the site of an old bridge, the causeway is no more. In its place, a steep singletrack path winds into a rocky ravine, crossing the stream with a spectacular view to the left: a terrific and unexpected waterfall. Beyond the falls, the trail climbs up and out of the gully and back to level ground. The Rocky Trail takes off to the left; stay right, approaching within minutes a particularly delightful part of the narrow gauge where the railroad’s wooden slabs remain. The trail continues slowly but surely down to Glade Creek, crossing it at around 5.7 miles. 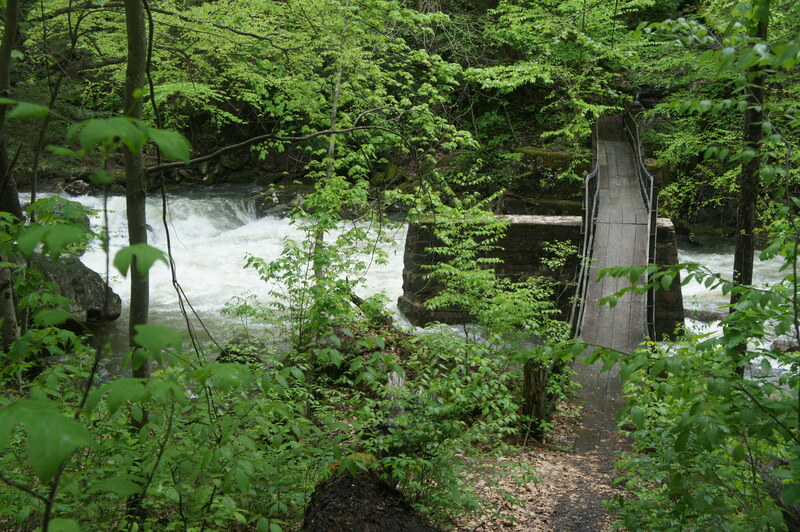 Here a narrow, wooden bridge—supported by a single stone bastion—crosses a particularly fierce section of the creek, a swirling artery of whitewater. After traversing the bridge, it’s back uphill again as the trail cuts west along Glade Creek’s southern slopes. The climb is gradual, ascending a mere 50-75 feet in around 6/10 mile, but it’s enough to put the creek behind and mostly out of view. 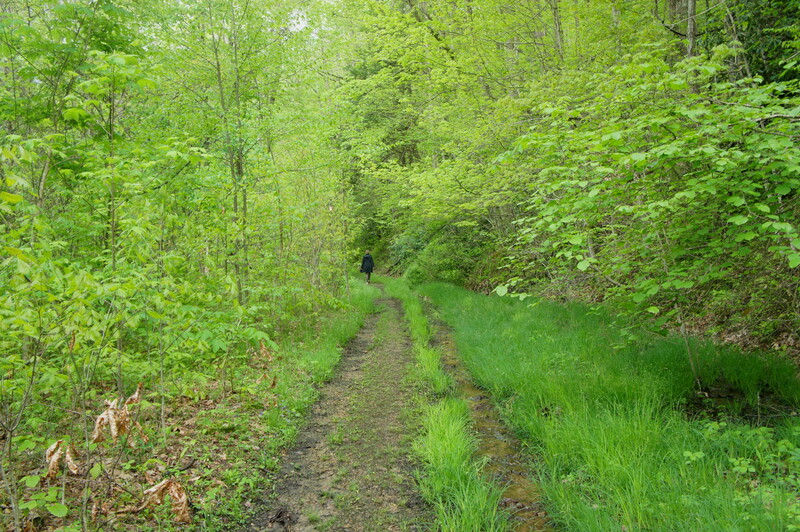 At 6.3 mile, the Narrow Gauge Trail ends abruptly at Old Sewell Road. Before heading left, follow the sound of rushing water across the road, where Sugarcamp Run somersaults over a set of seemingly endless cascades. 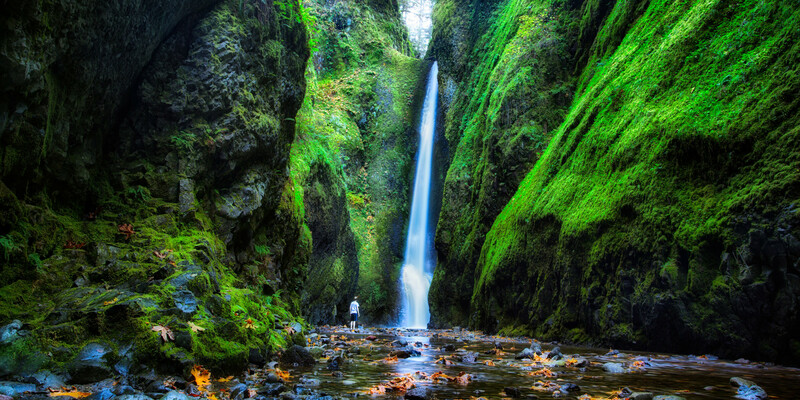 This tucked-away cascade is surrounded by beautiful greenery, and the oozing waters remind one, albeit on a much smaller scale, of the stupendous waterfalls of the lush Columbia River Gorge in northern Oregon. 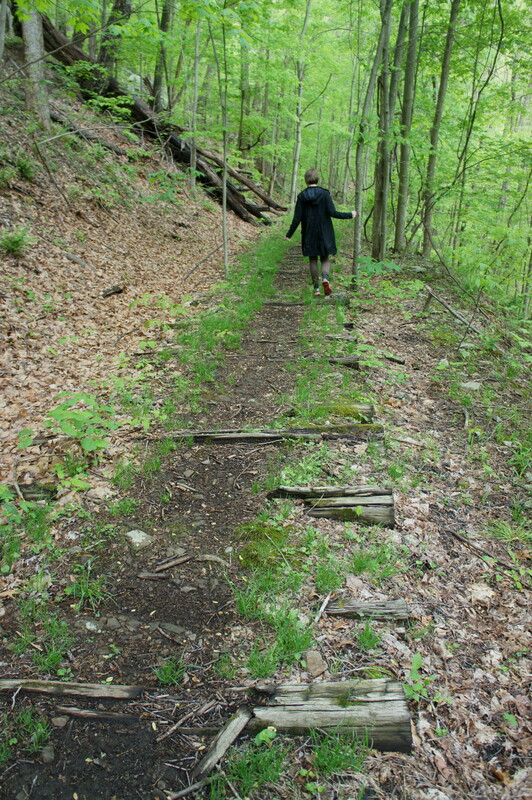 After leaving Sugarcamp Run Falls, head east on the Old Sewell Road, an overgrown, double-wide track that once provided vehicle access from the mill to the old mining town of Sewall on New River. 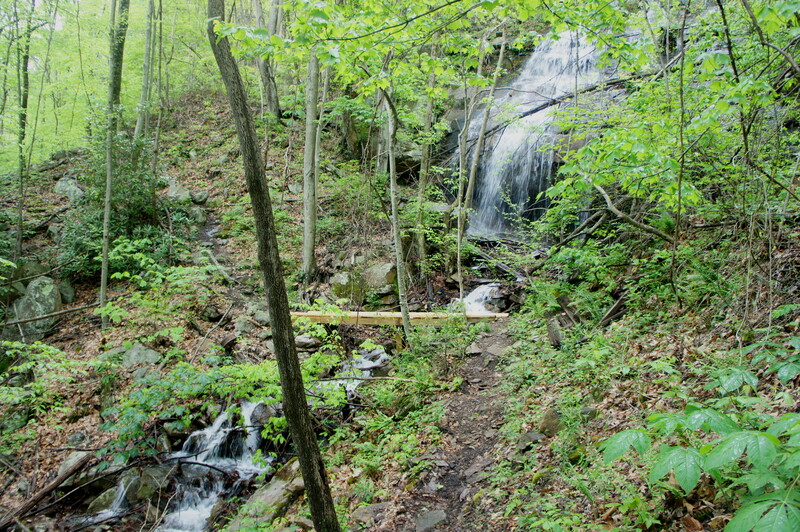 The easy, level path passes over another tributary of Glade Creek after 8/10 mile; look to the right for yet another set of tumbling cascades. Within a couple hundred yards, walk around the metal gate, after which the road is paved and passable by car. With the ever-present sound of Glade Creek to the north, the narrow drive passes Cabins 7-13 in reverse order and rounds a sharp bend. 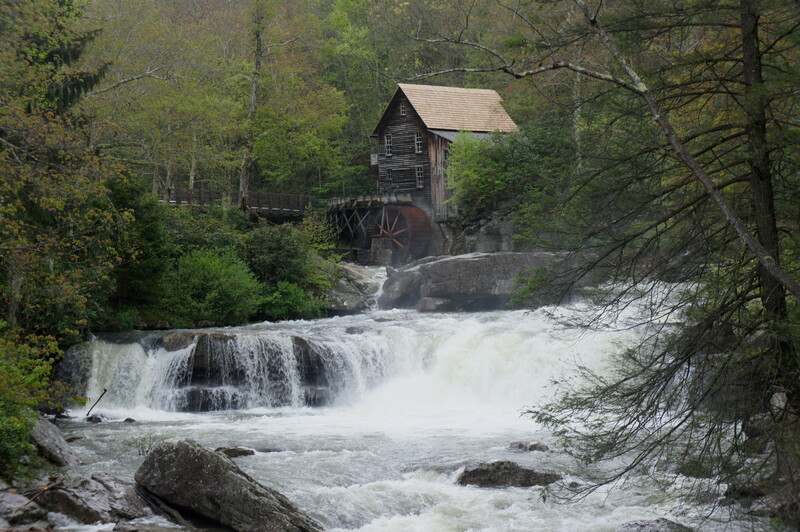 Along the homestretch, the road from the cabins offers excellent opportunities to mimic those picturesque photos ready-made for nature calendars: the falls with the grist mill beyond. Pass the mill and bear left, crossing the bridge over Glade Creek, to return to the starting point after a long and (hopefully) rewarding hike. At roughly 7.8 miles, it’s wise to allot at least four hours for the entire circuit, though many hikers will probably want even more time for breaks and exploration. 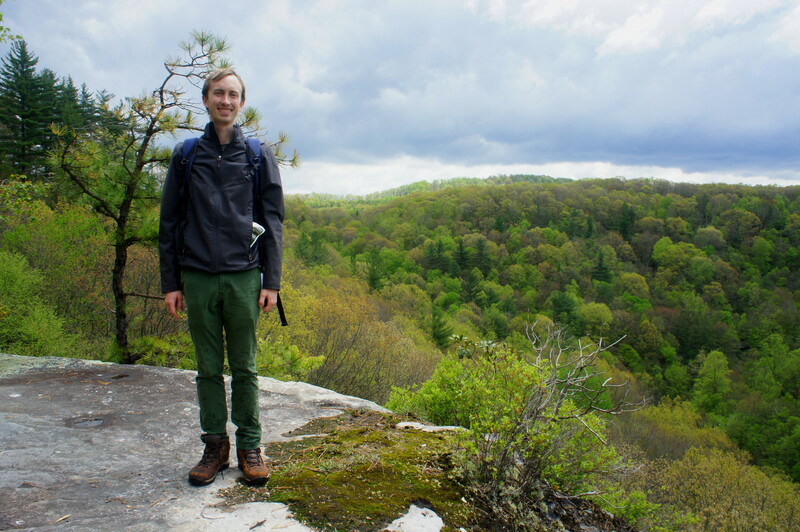 If you have room for just one day hike in Babcock State Park, this is the one to do. 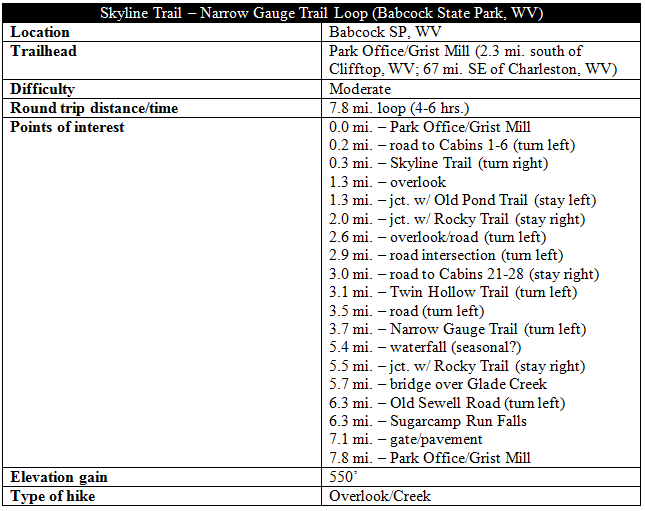 This entry was posted in Babcock State Park, Moderate Hikes, West Virginia and tagged Babcock State Park, cascades, Glade Creek, grist mill, historic, loop hike, Manns Creek, Narrow Gauge Trail, New River Gorge, Old Sewell Road, Skyline Trail, Twin Hollow Trail, waterfall, West Virginia. Bookmark the permalink. Hi and thank you for this post. I have been asking around for over a year about other falls in Babcock and you are the first person I have found with info. I would like to use your info and photos on my website and in a new book I am writing. Please contact me to discuss and thank you for the info. Hi there – glad the post was helpful. Go ahead and send me an email at liveandlethike.com with more info on the book and what photos you would like to use. Happy to discuss. P.S. I’ve been amazed at the lack of info on Babcock considering it’s such a beautiful place.